Just Bought Two Orchids in Bloom Should They Be Repotted? I just bought two orchids that are in full bloom and am wondering if I should repot them now or if I should wait. They are still in the small clear plastic pots they came in. In the pic the pots they came with are next to the plants. 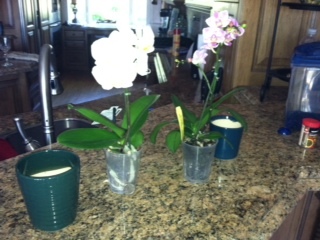 Comments for Just Bought Two Orchids in Bloom Should They Be Repotted? Since your new orchids (nice pictures by the way, thank you for those) are in full bloom now I would wait until they are done blooming. I see no reason to re-pot them now. They look like big healthy orchids. It is not that I won't re-pot when a Phalaenopsis is blooming but I usually only do it if the plant needs it, like if the roots are rotting or there is a fungal infection or the like. I would just enjoy them while they are in bloom as you might break the spike while trying to re-pot. If the pots drain (and it looks like the pots you have do) then these pots are fine. 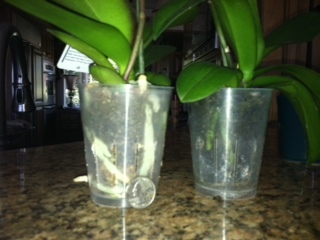 I actually really like these clear plastic pots for growing Phalaenopsis orchids. If you want to make the plants look nicer if you do not like the pots they are in, then you might put them in a slightly larger more decorative pot. I think the pots next to your plants are that kind of pot. Just make sure that your Phals. drain when you water them and that they do not sit in standing water. Often decorative pots do not have drainage, or adequate drainage.